A driver and three juvenile passengers were treated for minor injuries after a car downed a utility pole Thursday at the 4300 block of Otterbein-Ithaca Road, Arcanum. 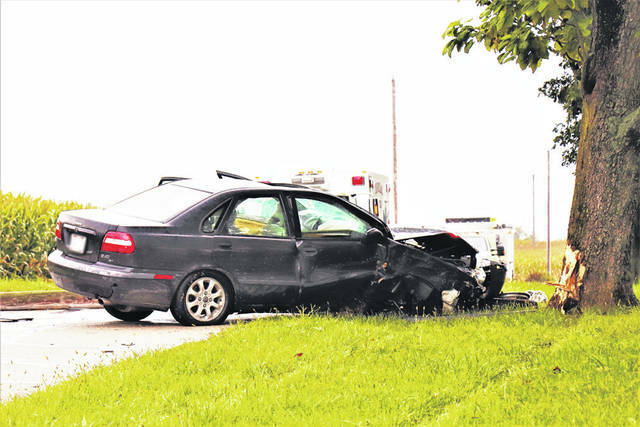 ARCANUM — A male driver and his three juvenile passengers suffered minor injuries after an accident Thursday evening. At approximately 5:25 p.m., personnel from New Madison Fire Department and Tri-Village Rescue, along with deputies from the Darke County Sheriff’s Office, were dispatched to the 4300 block of Otterbein-Ithaca Road, Arcanum, in reference to a single car accident with injuries. Arriving units found a vehicle with heavy front end damage with a utility pole and power lines down across the roadway. According to deputies at the scene, a dark blue Volvo S40 was traveling westbound on Otterbein-Ithaca Road when it drifted off the north side of the roadway into the wet grass, causing the male driver to lose control and make contact with a tree and utility pole before coming to rest. The resulting actions caused the utility pole to break off at the ground, pulling down power lines from the residence located at 4304 Otterbein-Ithaca Road, as it fell. The male driver and his three juvenile passengers were treated at the scene by Tri-Village Rescue before being transported to Wayne HealthCare for minor injuries. Dayton Power and Light was requested to the scene to help restore power to the residence. The accident remains under investigation by the Darke County Sheriff’s Office.